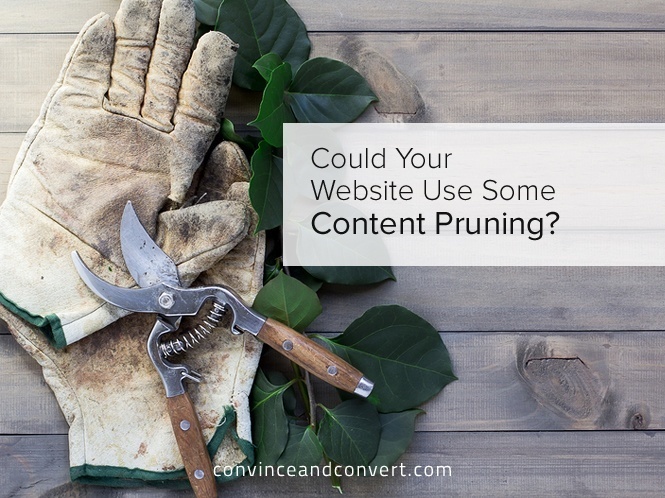 Could Your Website Use Some Content Pruning? You need to prune your content. We all do. Digital endeavors are essentially experimental, so they require a certain amount of room to develop in terms of both size and quality. Moreover, Digital is an inherently fast-paced environment, so the worth of your content will keep going down every single day. You can do a lot to slow this depreciation, even down to a crawl, but you can do very little, if anything, to stop it. Although the concept emerged in the tools arsenals of SEO specialists, and should be addressed from their perspective, we cannot afford to ignore that content pruning is bound to impact most components of digital marketing. In fact, from user experience and content strategy to inbound marketing and even company culture, the process of thoroughly pruning your content will reveal major pain points, while clearing the path for sound strategic planning. Content pruning is periodically needed to improve your Google rankings. Since Google rolled out Semantic Search and the Panda Algorithm Update, now arguably at its 25th iteration, website editors have been faced with the difficult decision of reducing the number of indexed pages. Constantly replacing or removing broken links and mercilessly pruning outdated content must stay high on your priority list. Keeping your website fresh and up-to-date is crucial in order to keep your competitive edge and steadily climb the search engine results pages. The underperforming content indexed by Google is pulling your entire website down. It can be described as the digital equivalent of dead weight. A clear description of your content, which clients and stakeholders can otherwise perceive as nebulous, whether expressed through text or rich content. It provides the foundation for comparing existing content with both user needs and competitor content, letting you identify potential gaps and opportunities. It offers insights that help you make decisions about your content more easily. It can reveal pain points, themes, relationships, etc. Content pruning will offer consistent help with your Search Engine Optimizations. Ultimately, the most important reason for periodically pruning your content is reputation. Regardless of the standards imposed by search engines, your digital project is working because you are offering valuable and entertaining content to your users. Removing or at least revising underperforming content is the least you can do to welcome your online customers. First of all, know your content. Becoming familiar with it in the early days of the project is as easy as surfing the website itself, but you will need to keep a content inventory to even stand a chance of holding on to the bigger picture further down the line. As to precisely what the content inventory spreadsheet should contain so that it becomes an effective tool, it depends a lot on the nature of the project, and it entails the type of analysis that deserves a completely separate article. Make sure you know your audience. The content must be tailored to their particular needs and standards. Most importantly, in order to ensure that your content outlives your competition’s attempts on the same topics, value insight over form, and honesty over marketing fluff. Let me give you an example: If someone is searching for this year’s lineup at the Winnipeg Folk Festival, and one of your pages ranks first in that particular SERP, but your content presents the lineup of 2009, your users will instantly click back, no matter how great your content is. In turn, this will affect the way your whole website performs in searches. It sounds complicated, but it truly is not. Not all your content will offer ultimate guidance on every topic addressed. Remember: you are building a website, not an encyclopedia. Just make sure that your content offers reliable insights, it links toward other great content, and the topics are as clear as possible, in accordance with your content strategy. You should turn to your company’s SEO specialists in order to evaluate the true online value of your pages. Google Analytics is sometimes the only tiebreaker when facing tough decisions about content pruning. However, if you believe the content you are about to take down is still quite valuable, you can always repurpose it. From website architecture to the way calls to action are displayed, all UX elements that brought the user to the page contribute to the success of that particular page. Beware: You might be about to take down tremendously valuable content that is either hard to access or not useful to the crowd that ended up viewing it. This is precisely why your SEO specialists should have the final say when it comes to content pruning. They are trained and equipped to understand why certain content is performing the way it is. Don’t remove the content in question if it is relevant, accurate, and comprehensive; if it still exerts influence and generates engagement in a clear, stylish way; or if it is as reachable and usable as it was when it first hit the SERPs. Surely, it will need pruning, but only to improve it, update it, and keep it relevant in the fast-paced environment it’s bound to inhabit. The R stands for redundant, the O for outdated, and the T stands for trivial. ROT has become one of the basic tools that every SEO specialist will readily rely upon when pruning content, and for good reason. Redundancies and duplicates occur for many reasons. In my experience, the main causes are inefficient Content Management Systems (CMS) and the lack of periodical content pruning sessions. Outdated content can impact your credibility, breed distrust, and result in customer inquiries that otherwise would not be necessary. It boils down to this: either update the content, or get rid of it. By definition, trivial content is anything but useful. It might have seemed useful at the time it was created, but you need to look at it objectively and decide if it still has any value today. If it doesn’t, prepare to say goodbye. Delete the page, and let the search engine bots find a missing page (a 404 error message). You should probably consider this last. Delete the page, but redirect it to something relevant, so that the search engine bots find a redirect instruction (a 301 message) and, in the case of Google, transfer PageRank from the old post to the new one. Rewrite the outdated webpage into a good new page. This is one of the best options, but sometimes there’s really nothing you can do to save a dying page. Keep the page as it is, making sure the links therein aren’t broken, and updating the page when needed. In all cases, you need to address very particular issues before making any decisions regarding the fate of your content, either before publishing as part of your content strategy or later on as part of your content pruning sessions. Content pruning isn’t merely a “spring cleaning” best practice. It impacts many aspects beside the website’s freshness and weight by contributing decisively to your content strategy. Ultimately, content pruning is bound to offer precious insight into the evolution of your business logic. With over 15 years of experience building companies, Alexander Kesler is an experienced entrepreneur with hands-on traditional and digital marketing experience. He is currently the President of inSegment, a Boston-based full-service digital marketing agency.